In purchasing equipment for the outdoors, I always use the same thought process. How often am I going to upgrade my equipment based on the new radical improvements that the manufacturer will come out with? How long before my existing equipment will become obsolete and I will have to replace it? How long will it be before I have a disadvantage with my existing equipment? When the time came to choose a spray skirt, I decided that I would choose the best spray skirt that I could afford based on the use of the spray skirt. What is a spray skirt? A spray skirt is worn by the kayaker. The spray skirt connects to the cockpit of the kayak to create a watertight seal. This prevents the cockpit from filling up with water and at the same time keeps the paddler dry. Who should wear a spray skirt? Any kayaker that doesn't paddle in calm conditions should always wear a spray skirt. The spray skirt MUST be able to be easily removed during an emergency or a capsize. Either bring in your own kayak to the retail store or if the retailer has the same boat, try it out. Never purchase a spray skirt without trying it on your boat. Sit in your boat and try to remove it by grabbing on to the grab loop on the top of the spray skirt. If it is extremely hard to get off, it will even be harder during an emergency situation. You must be comfortable about wearing the spray skirt that you choose. If you are purchasing a spray skirt to keep out water (and some don't keep out water 100%), it must keep out the water. If you are purchasing a spray skirt for the warmer summer months, the type you choose might let a little water into the cockpit based on the design of the spray skirt. Some spray skirts are designed specifically for a type of kayak and some spray skirts are generic. Make sure the spray skirt fits BOTH the cockpit and your torso. A good fit for the cockpit and a poor fit on your torso is not the spray skirt for your needs. When trying on a spray skirt, keep in mind the clothes, dry suit, etc. that might be worn underneath the spray skirt. The rand is the edge of the spray skirt which goes around the edge of the cockpit and holds the sprayskirt taut in place. The rand can either be a bungee elastic cord with a knot at the back of the spray skirt to adjust the tightness or a one piece rubber or neoprene piece to fit snuggly on the cockpit. The disadvantage of the knot at the back of the cockpit is that type of spray skirt will leak a bit (around the back and around the edges) as it is NOT a watertight seal. I use that type of spray skirt during the summer months. Some spray skirts have a pocket for storage, adjustable waist bands, suspenders, etc. Keep in mind that every spray skirt that has adjustments will have a better chance of leaking than the one piece spray skirts. Spray skirts are made from neoprene, nylon or a combination of both materials. Whitewater kayaks use neoprene while touring kayaks use neoprene, nylon and a combination of both materials. I have several types based on the temperature and the time of year. 1. Neoprene: These spray skirts are snug, tight, thick to keep in the warmth, very tight fitting on the cockpit, can withstand rolling, bracing and high wind and waves. They sometimes get very warm during hot days and the neoprene spray skirts with an adjustable rand will tend to leak a bit. 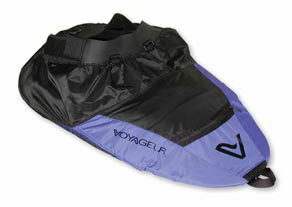 They will keep the paddler very warm during colder conditions and it is the only choice during the winter months. 2. Nylon: Nylon spray skirts are easy to attach, easy to remove, offer adequate seal to keep water out, comfortable, sometimes breathable, sometimes waterproof and are used during warmer conditions. The nylon spray skirts will either have neoprene for the torso or nylon. The nylon spray skirt should not be used during rough conditions. 3. Nylon/Neoprene: This type of sprayskirt has a nylon torso with a neoprene base. The neoprene holds tightly to the cockpit while the nylon brings comfort to the paddler. Please keep in mind that this spray skirt will not be totally waterproof and will let some water in when capsized. There are also half spray skirts that fit over the top half of the cockpit to help keep water out, let air circulate and at the same time protect from water getting into the kayak. These are used during very warm weather conditions. Always wear the PFD over the spray skirt as the PFD will tighten the spray skirt to give a better seal. When you put your spray skirt on to the kayak, start from the back and work forward... always making sure that the rand is tight on the cockpit. Check again to make sure that there are no openings. MAKE SURE THE FRONT GRAB LOOP IS NOT UNDER THE SPRAY SKIRT. If you are unable to pull the grab look during an emergency situation, you will be in trouble. Attach a little plastic practice golf ball (the ones with all the holes) on to the grab loop as it will help you hold and find the grab loop during an emergency situation. Don't forget to learn how to maintain your spray skirt correctly because incorrect methods might damage your spray skirt and choose your spray skirt wisely.